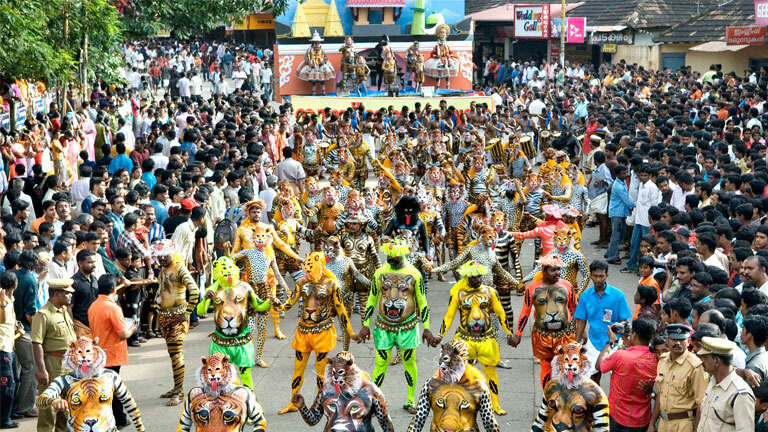 Pulikali (puli means leopard and kali means play) is a dance performed by men adorning the costume of leopard. It is performed in different parts of Kerala during the festival of Onam. Yet, the one that is performed in Thrissur district is quite old. From children to elderly people take part in Pulikali. The performer will be wearing masks of leopard face and body painted in black and yellow. Leopard faces are also drawn on bellies. The group comprises predominantly male leopards with few female and child leopards. Since wearing masks, there is no significance for facial expressions. Men with potbellies shake it and dance, which is real fun to watch.